November 8, 2018, 9:29 PM · Welcome to "For the Record," Violinist.com's weekly roundup of new releases of recordings by violinists, violists, cellists and other classical musicians. We hope it helps you keep track of your favorite artists, as well as find some new ones to add to your listening! 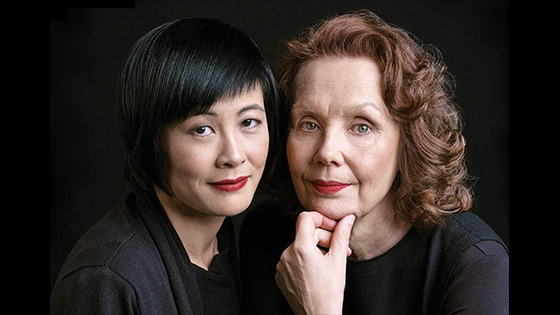 Violinist Jennifer Koh and composer Kaija Saariaho. Photo courtesy Cedille. Violinist Jennifer Koh performs five works by Finnish composer Kaija Saariaho, including the world-premiere recordings of "Light and Matter" for violin, cello, and piano, inspired by sunlit colors and shadows in a city park outside the composer's window; as well as the violin and cello version of "Aure," meaning a gentle breeze, created for and dedicated to Koh and cellist Anssi Karttunen, another champion of Saariaho's music. The albums largest work is the one that first attracted Koh to the composer: the violin concerto Graal Théâtre, written for Gidon Kremer, which Koh has performed many times and performs here in the composers chamber-orchestra version. "Tocar," Spanish for "to touch," explores the playful and tactile aspects of the word through violin and piano. "Cloud Trio" for violin, viola, and cello was prompted by shape-shifting clouds in the French Alps. BELOW: Jennifer Koh talks about working with composer Kaija Saariaho on this music. Herbert von Karajan called her "the greatest musical prodigy since the young Menuhin." Anne-Sophie Mutter in turn praised Karajan for teaching her "to think the music through to its logical conclusion and impose a sense of direction on it." From their earliest recordings together, starting with the Mozart concertos in 1978, their musical partnership won universal acclaim. DG's hardback 3-CD + Blu-ray Audio edition features early recordings of Anne-Sophie Mutter accompanied by Herbert von Karajan and the Berliner Philharmoniker, including performances of concertos by Mozart, Beethoven, Mendelssohn and Bruch. It also includes a 60-page booklet with new notes by Jürgen Kesting. BELOW: An early rehearsal and performance by Anne-Sophie Mutter of the Beethoven Violin Concerto, with Herbert von Karajan conducting.